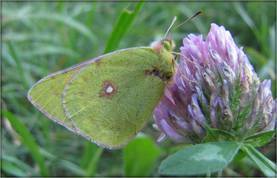 Menetries' Clouded Yellow, Желтушка тизо. The species is distributed in Caucasus, Transcaucasia, Turkestan, Uzbekistan, Tajikistan in Altai, Tuva, Eeastern Sayan, and China. Armenia is inhabited by subspecies strandiana Sheljuzhko, 1935. In Armenia the species occupies subalpine grasslands and occurs on almost every mountain ridge at the elevation range from 2,400 to 3,500 m a.s.l. The larvae grow on Oxytropis cyanea and Vicia sp. Butterflies are on wing from early to mid June until late July and even beginning of August in one generation. The species is quite uncommon within typical habitat. Its population trend demonstrates moderate decline (p<0.05), which is most probably a result of overgrazing. In Armenia the outrun type of livestock farming is practiced and the farmers move the livestock higher in the mountains starting from late June. In the same time the host plants of the species are eatable for the cattle and sheep, which can eliminate the density of the host plants, especially at the elevation below 3,000 m a.s.l. There is a small scale trade of the species, which though has a small scale and can hardly influence the population of the species. The species has not been assessed for IUCN, European, and Armenian Red Lists. Also it is not included in the CITES and Bern Conventions. Preliminary assessment of the species' conservation status suggests it as Near Threatened. The distribution range of the species is partly covered by Zangezur Biosphere Complex and Lake Arpi National Park, as well as by several Emerald Sites: Zangezur, Gorhayk, Aragats Alpine, Rhododendron caucasicum sanctuary, and Lake Arpi﻿﻿. The species is presented in Lichk Prime Butterfly Area.​ The following conservation measures are suggested: (1) inclusion of the species in the next edition of Red Book of Armenia; (2) develop management plans for the designated Emerald Sites and consider non-intensive grazing schemes; (3) designate new Prime Butterfly Areas and Emerald Sites to increase the coverage of internationally protected parts of the species' distribution range; (4) to regulate the trade of the species.